With summer at its peak, there’s nothing better than getting out on the highway for an epic roadtrip – and of course, bringing your furry friend along is a must. However, before you load up the cooler, taking a few minutes to think about safety with your dog in the car could literally be a life-saving endeavor. All of this is to say that driving with pets can be dangerous for both you and your number-one pal. Not only are pets natural-born distracters, they can be seriously injured — and can seriously injure you — if not properly restrained. And if you’re in an accident after your pet distracts you, you could be held liable for the damages. 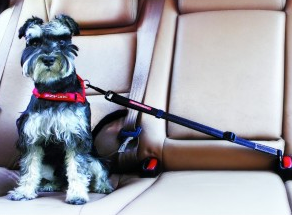 Dog Seat Belt Restraint – If you already have a harness you love (we recommend an Ezydog dog harness), this can be a great add-on to keep your pooch restrained in the car. 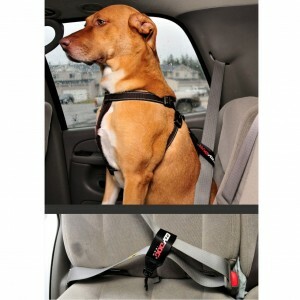 Easy to use and inexpensive, this is a great choice to keep your dog restrained and prevent driver distraction. 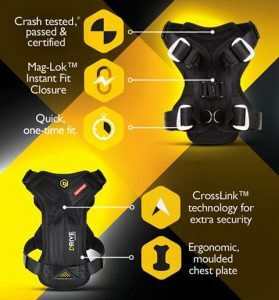 Caution: while an excellent choice for preventing driver distraction, this restraint (and the adjustable version) is not designed for crash protection. Click Adjustable Dog Seat Belt Restraint – This innovative restraint clicks directly into your seatbelt buckle receiver and is adjustable so you can give your dog as much back-seat freedom as needed. Fully compatible with all dog harnesses that have integrated d-ring attachments, this will safely and securely keep your pooch restrained to the back seat. Whether you’re taking that epic road trip you’ve always dreamed about or just out and about running errands, having your furry friend along for the ride makes it better. Ensure that your pooch, your other passengers and you are safe before you hit the road. Click to see all of EzyDog’s dog car safety products.